Here's a pic of the White Fat Chocobo (or Original Fat Chocobo as it's called in game). I received this when I got my Maid set (I'll post pics later of my White Mage who's gear is glamoured to look like a maid, I have them taken just haven't gotten around to uploading them) during that Amazon promotion. He even has a little crown. His animations are exactly the same as the yellow one so that's why the greens are present again. These fat chocobos are too damn funny looking. There's one more I can get but I need 3000 player commendations to get it. 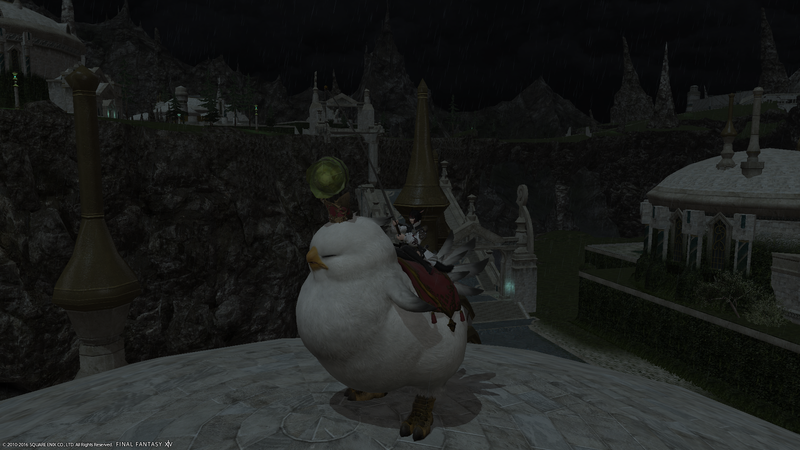 It's called the Parade Chocobo and it's basically the yellow fat chocobo with the crown. Sadly I'm really far away from getting the necessary commendations (last I checked I have 820) because people don't like giving commendations to dps (commendations are basically a way of rewarding someone for doing a good job in an instance, I get a lot more then I used to but it's still hard to get them as a dps as most of the time people give their commendations to tanks and healers).